This lesson will present an overview of the hobby. Traditionally people when people think of philately or stamp collecting, they think of stamps themselves. That is where we wil start. Mint stamps are new stamps that have not been postally used. Used stamps are stamps that have been postally used. The stamps below have all been used in the mail, they show the tell-tale cancellation marks applied to prevent their re-use in the mail. Commemorative stamps are issued to commemorate a special event, person or subject. They tend to be larger in size, are issued for use on first class mail, and are printed in smaller quantities. 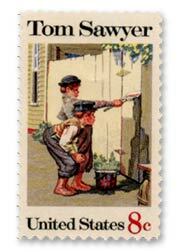 The Tom Sawyer stamp shown below was issed in 1972 commemorating “American Folklore”. Definitive stamps are the ‘workaday’ stamps that are most commenly used on daily mail. They are typically smaller, are issued in very large quantities and in many different denominations and stay on sale for long periods of time. 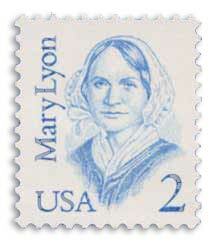 The definitive 2¢ Mary Lyon stamp show below was issued Feb 28, 1987 when the cost to mail a letter was 22¢. Special Stamps are a kind of hybrid, mixing the regular use of a definitive stamp with the color and appeal of a commemorative. 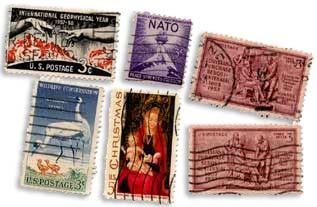 The most familiar of these are Christmas and Love stamps, and also include international rate stamps, Holiday Celebration stamps, Priority Mail and Express Mail stamps.